Last year Berrien Regional Education Service Agency, Berrien Springs, MI, charged with caring for the community’s special needs children, faced state budget cuts and had to find a way to lower costs without compromising safety. It needed specialized vehicles, a flexible and compassionate staff and nurses to ride routes. Officials were not sure what they would find when they first considered outsourcing the transportation program. Today with a depleted economy leaving many transportation directors to operate against this backdrop of shrinking budgets and increased demand, outsourcing is one solution to providing more for less. Successful outsourcing requires a partnership such as the managers at FirstGroup America have developed with hundreds of school districts, cities and fleet managers to deliver services at lower costs without compromising safety or quality. Cost savings is generally the number one reason organizations look to outsource their transportation programs. According to the Council of Great City Schools, school districts can save as much as 18 percent through outsourcing transportation. However, we have seen savings as great as 40 percent with the correct transportation model. Berrien County Regional Education Services expects to save one million dollars every year for each of the five years of its contract with First Student. It is not enough simply to lower costs. Transporting children responsibly to and from school requires cooperation and coordination on every level. Contractors can add tremendous value in terms of expertise in safety and training as well as in administering an efficient transportation program. Outsourcing to contractors who provide expert management and superior service allows school districts, fleet managers and transit operators to concentrate on what they do best. A complete turnkey operation, such as the one First Transit provides for the Texas State University San Marcos campus shuttle system, is a key advantage to the transportation program. 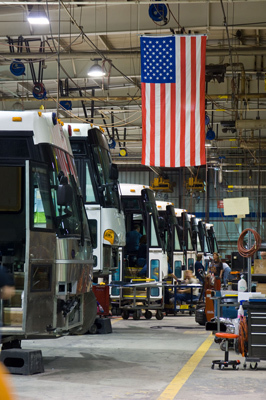 First Transit provides all the equipment, maintenance, personnel and fleet management, and its services guarantee a professional appearance and clean equipment. The greatest resistance to outsourcing transportation comes from the stakeholders, which includes drivers and board members, as well as the public who may not be aware of the process and its overall advantages. The National School Transportation Association (NSTA) reports that driver resistance is often the most difficult barrier to outsourcing because many drivers immediately fear their jobs are at risk. Usually the outsourcing agency can overcome any anxiety through assurance and understanding. Professional drivers are the front line in any transportation operation. The best organizations regard drivers as a tremendous asset. As a matter of course with any new contract First Transit seeks to hire and retain as many employees from the current operation as possible, provided they undergo and pass the requisite background checks. When the stakeholders understand the benefits, outsourcing evolves from what some might consider a bitter pill to a transformational win-win for everyone involved. Carey Paster is president of commercial development, marketing and sales for FirstGroup America, Cincinnati, OH.